Every case that Claire Britten cracks is a win, not only professionally but personally. The forensic psychologist has spent a lifetime fighting a neurological disorder, and her ability to conquer it is a testament to her razor-sharp intuition. Nick Markwood is used to winning in the courtroom, so when his latest case is overthrown by Claire's expert testimony, he can't help being impressed by her skill. He needs her on the team of his passion project—investigating unusual cases involving mysterious deaths. Her condition doesn't deter him, and neither does the attraction that sparks between them…even if it should. As they join forces to investigate a murder in St. Augustine, Florida, Claire is thrust into a situation far more dangerous than she'd anticipated, pushing her disorder to a breaking point. Just when she fears she can't trust her own mind, she discovers Nick's personal connection to the case—and wonders whether she can trust anyone at all. I hadn't heard of a forensic psychologist before but it seems to be a rather interesting profession and Claire is an interesting character. She is a single mom who is starting up her own business and dealing with a rare disease that has the risk of derailing it all. Still she has plans for herself and her daughter. Nick is a hot shot lawyer who really liked how Claire handled her last case even though it was against his client and now he wants to hire her. He has taken on a pro bono case where a woman is being accused of killing her mother though it could have been suicide. Now Nick knows them both and doesn't feel that either option is correct. 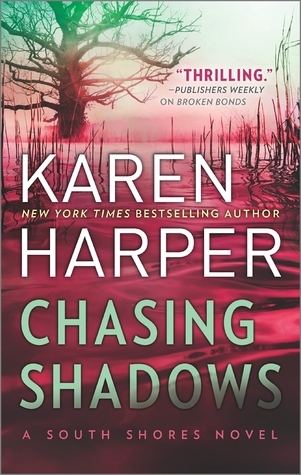 CHASING SHADOWS is one of the books that grab the reader right from the get go. The characters are wonderfully detailed and quirky, and the dialogue is witty. The danger keeps coming from unexpected angles. Definitely a page turner. I found the conclusion to be both satisfying and terrifying as Claire and Nick wrap up one case just to have another jump into their laps. And this one is personal. I do recommend CHASING SHADOWS to any of my readers who enjoy a well crafted romantic suspense. It is the first book of a new series and I am waiting impatiently for the second book.